On infrequently travelled asphalt or macadam side roads, our self-guided bike tours wind through ever-changing and amazingly beautiful landscapes. Our journey is rich in cultural sites such as monasteries and old churches. Daily cycling routes are selected so that after the ride there is always enough time for relaxation, and activities such as swimming and sightseeing. 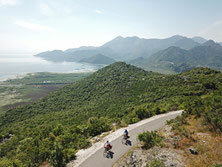 This is ideal for those cyclists who like to make their own way, and wish to enjoy the beauty of Montenegro independently. 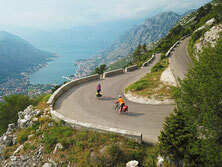 "Self-guided" does not mean that you're completely on your own in Montenegro. Enjoy the flexibility to ride at your own pace and take breaks at your leisure. In the meantime, we organize the logistics for you. You travel without a support vehicle, so it is your responsibility to arrive at the next hotel every day, even if you have to cycle in bad weather or simply don't feel like biking anymore. BUT, if you do run into serious trouble, (e.g. your bicycle has a major mechanical problem or you have a physical emergency), you can of course call our emergency hotline. We will offer you as much support as possible, whether this means sending a car or advising you on your public transportation options, (e.g. bus or train connections). Please be prepared to fix flat tires and other small mechanical problems along the way. Repair kits and spare inner tubes are provided. 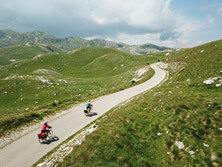 We rent out quality touring bicycles and electric bicycles with rear racks. Upon request, we can provide waterproof panniers, (20 liters each). You are welcome to bring and attach your own bike saddle and pedals. Helmets are included in the bike rental, but if you are not comfortable with a borrowed helmet for hygiene or safety reasons, we kindly ask you to bring your own helmet with you.